Larwa Men's Wedding Wear Dhoti by Larwa at SCRHI. MPN: 43230-120765. Hurry! Limited time offer. Offer valid only while supplies last. If you have being dying for the best dhoti out there, you have got to invest in this pair of Silver colored dhotis that is brought to you by Larwa. 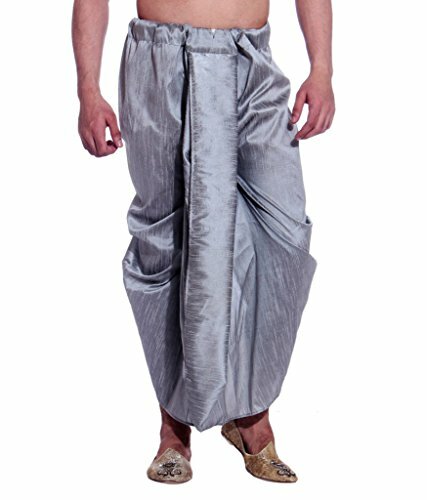 If you have being dying for the best dhoti out there, you have got to invest in this pair of Silver colored dhotis that is brought to you by Larwa. Crafted from a rich quality silk blend fabric, this pair of dhotis is soft to touch and light in weight too. Further, they will be extremely beautiful when you slip into them. They come up in solid silhouette and will work well with contrasting kurta. If you want comfort and quality together in one accessory, these are the dhotis for you. Team it up with a pair of mojaris to get the perfect traditional look. If you have any questions about this product by Larwa, contact us by completing and submitting the form below. If you are looking for a specif part number, please include it with your message.